Today I’m introducing my Vegan Series! And the first dish: meat-free moussaka. I decided to introduce this Vegan Series for a few reasons: 1) Levantine vegan/vegetarian food is very much underrepresented yet equally delicious; 2) eating more plants is better for our Earth; 3) we are now in the middle of a 6 week period where millions of Orthodox Christians are refraining from consuming animal products (including dairy) during Lent. While I was not raised in an Orthodox Christian household (I’m Muslim), this group is very much a part of Syrian culture and identity. They have specific traditions and celebrations, and during this sacred time of fast, they also have certain foods. Our version of moussaka happens to be meat-free in origin. This dish is not only eaten during Lent. In fact, you can find it on any Syrian’s table at all time of the year (but especially in the summer when these veggies are fresh). I love this dish. Tomatoes, fried eggplant, caramelized onions, garlic and bell peppers are layered and cooked together in the oven until they get silky, sweet and delicious. Moussaka is typically eaten at room temperature as an appetizer with pita bread, but feel free to make this a plant-based main course. If you give this one a try, don’t forget to put it in the comments and to tag @omayahatassi and #omayahcooks on Instagram! I love to see your creations! Delicious meat-free Syrian moussaka. 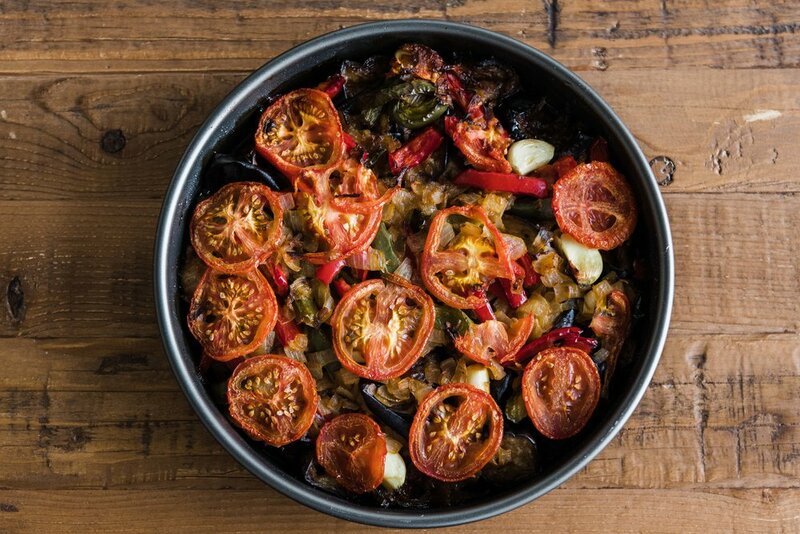 Fried eggplants are combined with tomatoes, caramelized onions, garlic and bell peppers. A round roasting pan is preferred so you can flip the finished dish onto a serving platter. If you don't have a round pan, a rectangular one will also work. Serve the moussaka in the baking dish. Eggplants can be fried up to 2 days ahead. Pour enough neutral cooking oil in the pot until the bottom is covered by 1/2 an inch. Heat to 350 degrees F over high heat or until a piece of bread is dropped in and starts cooking immediately. Deep fry the eggplant in batches until golden brown, about 5-8 minutes. Immediately drain in a colander set over a bowl. Leave to drain at room temperature for several hours, then place in the fridge overnight (if you place in the fridge immediately, the oil will not drain). Add onions and olive oil in a pan set over medium heat. Sauté until golden, about 15 minutes. Set aside. Add bell peppers to the pan and cook until softened. Add the onions and garlic and cook, stirring constantly for about another minute. Remove from heat, add lemon juice and salt and adjust seasoning. Preheat oven to 350 degrees F. In a 10 inch round roasting pan, add half the sliced tomatoes on the bottom. Top with half fried eggplants and sprinkle with salt. Add half the vegetable mixture and add 1/2 tsp sugar. Add the remaining eggplant slices and top with more salt. Top with the rest of the vegetable mixture and then tomato slices. Cover with foil and bake in the oven for about 2 hours, or until tomatoes start to shrivel and release moisture. Uncover for the last 20 minutes of baking. Remove from oven and allow to cool. Flip onto a round serving platter and serve at room temperature with pita bread.